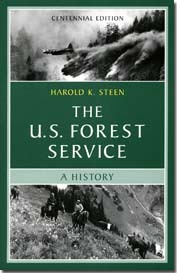 With a new preface by the author, this edition of the classic history (originally published in 1976) provides a broad perspective on the Forest Service’s administrative and policy controversies and successes. In his preface, author Harold Steen updates the book with discussions of the spotted owl issue; wilderness and roadless areas; new research on habitat, biodiversity, and fire prevention; below-cost timber sales; and workplace diversity in a male-oriented field. Forest History Society, 2004. xix + 145 pp.